Your dream backyard is so close to being complete, you can almost taste it! It’s time for the finishing touches and final details. But wait, is your backyard missing a shady area? Does your hot tub installation look incomplete? Or perhaps your outdoor dining area could use a little...something? It’s a backyard gazebo. That must be it. Lucky for you, gazebo installations look absolutely stunning AND they have the power to enhance the style of your home in many different ways. However, there is certainly a lot more to it than just extra good looks. Gazebos can serve a multitude of purposes that will increase the flexibility and functionality of your space. They can be used to store items, spend time with people, find shelter from the sun, and so more. For additional details and information on how to complete your backyard with a gazebo, read on! Many homeowners are motivated to install a gazebo due to the recreational use of the space. If you like games and entertainment, you could set up a ping-pong table or a patio dining set, for example. Even without specialized entertainment supplies, an outdoor gazebo could be perfect for simply lounging in the shade, away from the direct heat of the sun. You could even use your gazebo to create an outdoor living space. Complete with outdoor couches, chairs, coffee tables, side tables, and more! From outdoor dining and recreational activities, to having a drink or reading a book, the opportunities are endless! A screened gazebo installation is often used by homeowners who love privacy and prefer to keep their hot tub space away from the eyes of the neighbors. With a screened gazebo protecting the privacy of your hot tub, you are going to feel like you can enjoy a more exclusive and relaxing experience. Gazebo walls and ceilings can be seamlessly decorated with hanging lights and planters. 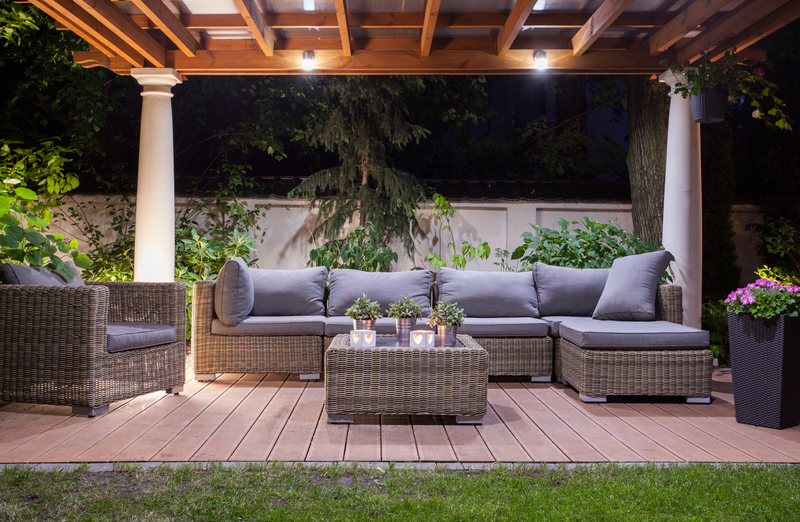 With the right accessories, you can seamlessly add style and good looks to your backyard area. These add-ons are often not only purely aesthetic, as they can add many new features to your space. For instance, garden gazebo twinkle lights can effectively be used to redefine the way you lounge around your hot tub after dark, creating more comfort and safety - even in low light conditions, where walking around in the backyard might be a bit hazardous. An outdoor gazebo could offer further protection to your hot tub, by preventing the wind from dragging debris into the water – especially while you’re inside! Furthermore, you can use the gazebo to store accessories, supplies and tools that are necessary for the daily cleansing and maintenance of your prized hot tub. That way, you can easily access your gear and take care of your hot tub whenever you need to get something done, without going back and forth to get the right tools from within your home or garage. As mentioned earlier, a backyard gazebo could shelter your hot tub from the wind, but it is also ideal to shelter it from the threats of rain, snow and other potential weathering that might affect your hot tub experience. Not to mention the wonderful atmosphere that is created by watching the snow or rain fall, from the comfort and warmth of your hot tub. For additional information related to gazebo installation, visit our Pool Brite hot tub dealership, located in the heart of Amherst, NY. Feel free to get in touch with us for further details, or browse our blog section for more information about our high-quality hot tubs for sale, creating a beautiful backyard installation, and more! Written on Friday, January 19, 2018.